Older Kids and Presents- What to Do? Kids who are in upper elementary school have definite ideas of what they want for the holidays, and it can be tough to convince them they’d like anything that they haven’t thought of first. It is also hard to get them away from their devices! While they often act like they they want nothing to do with you, tweens and early teens actually still need to have your support and the boundaries you provide during these up and down, on and off years. I believe that the best thing you can do, as a parent, during these years is to stay engaged in some stress free activities that will keep the lines of communication open between you and your tween/teen. 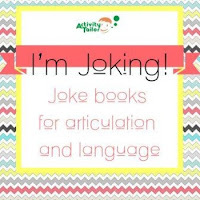 I am an SLP, so you will notice that the games I have chosen are mostly language based, but any game that your family can enjoy will be good! Conversations, and sometimes problems that are being encountered, can happen during games that all the questioning in the world won’t get your child to talk about! At that age, my son actually told me that I was asking too many private questions one day, when all I said was, “Hi! How was your day today?” We all survive! I would suggest any of these games if you think your child might play them, with a warning- unless your child really likes playing games, don’t expect excitement when opening them! One alternative is to wrap it as a family present and see who wants to open it for everyone. 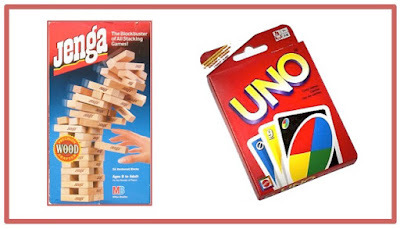 Card games, like Uno, and building games, like Jenga, are good for keeping everyone together, talking and just having fun! Another option is putting a jigsaw puzzle together. If you get one with a picture of your child’s favorite thing, you can glue it and use it as a room decoration afterwards! These games are fun group games that keep your child using their language skills, like describing and making associations between words. If your child is working on articulation skills, you can have them concentrate on saying their sound correctly during their turn in any word they say. 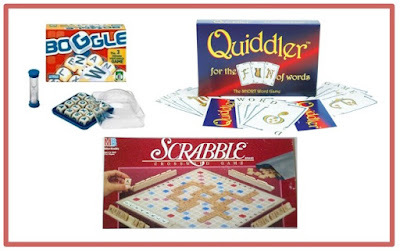 Scrabble and boggle are old classics that have your child expanding their vocabulary and spelling skills while playing. Quiddler is a newer fun game that works on these skills, too! So, now, a question for you! As I was looking for pictures of games for this post, I came across these 2 games. I have never played them, but I thought they looked interesting. Do you know anything about them? Would you recommend them? 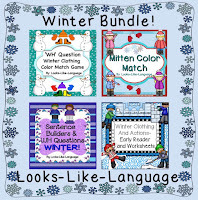 I’m always on the look out for good language games for older kids! Thanks for your help! 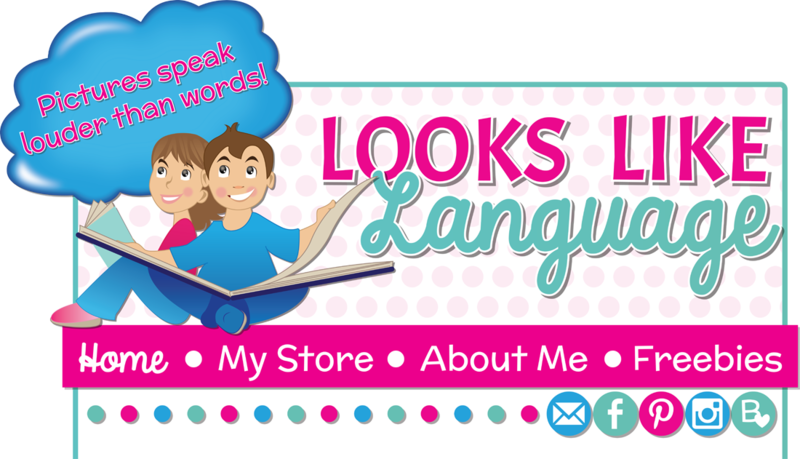 Thanks to Ashley at Sweet Southern Speech for the invitation to link up on this timely topic! 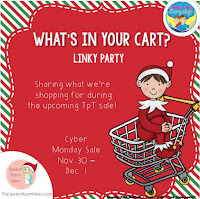 Stop by her blog to get the links for more great toy recommendations that will make your holiday preparations easier! The smell of delicious food cooking, warm and cozy inside with people I love around me- these are some of the things that make Thanksgiving one of my favorite holidays. No matter what your religion or politics, it is a celebration that is shared by everyone all across the United States, and there is comfort in that thought. Family gatherings encourage sharing recipes and stories, welcoming new family members to the family’s way of celebrating, remembering those who are no longer with us on that day, and sharing their stories, too! Life is full of change and traditions help us have some stability amidst the constant changes. However, traditions also change with time. While the way we celebrate Thanksgiving today is based on our history, it is certainly not the same! 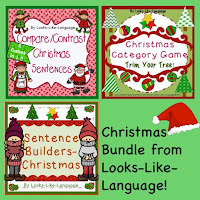 This opens up worlds of possibility for eliciting language at this time of year! 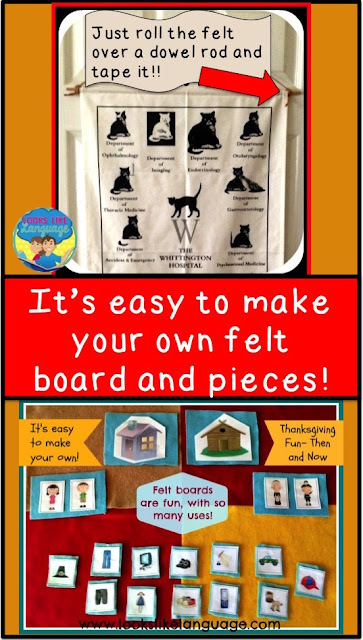 You don’t need to buy an expensive felt board to use felt activities. Just go to your local fabric store and buy a large piece of felt in your favorite color! If you have a cork board on your wall, tack it there. If you don’t, you can get a dowel at any craft or hardware store, roll the edge of the felt piece over it and glue the ends together. Make sure that the ends of the dowel stick out far enough past the edges of the felt that you can tie the ends of a cord on each side. Yarn and string will also work. Attach it to your wall with a nail, to a magnetic board using a strong magnetic clip that can grip the cord, to the hooks that are above the old fashioned blackboards… You get the idea- you can make it work! But, since I am a firm believer in providing visuals, here is a photo of a really funny wall hanging that my future daughter-in-law gave to me. I just threaded the dowel through the seam, tied a cord and presto- instant wall hanging! While those felt sets they sell are adorable, don’t despair if you can’t afford them! You can take any unlaminated pictures you want to use and just glue them to pieces of felt with regular school glue. Spread it thin, let it dry and you have an instant felt set! There are so many ways to use these! *Have the students label the pictures they want to place. Use additional pictures, like my old and new houses in the photo, and you have a sorting or categorizing task. *Ask a question about the vocabulary and let a student go find the answer. Give some clues about a one of the pictures and see if the student can find what you are talking about- an instant activity for building inference skills! 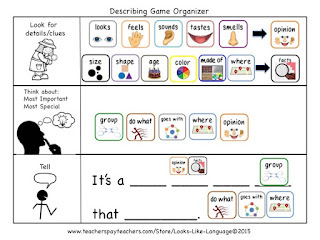 Leave extra room around vocabulary pictures, make doubles, and you have a movement memory game. *Turn one set of pictures over so that the photo doesn’t show, let the students take turns throwing a beanbag at the felt wall so that a picture falls down, or maybe more than one. The students only get to keep it if they use their target skill correctly. Bring the game back in the winter with a soft fabric snowball and you have indoor snowball play! Don’t have time to look for your own photos at this busy time of year? Check out Thanksgiving Fun- Then and Now or Thanksgiving Actions- A Then and Now Sentence Game. Possibilities abound! 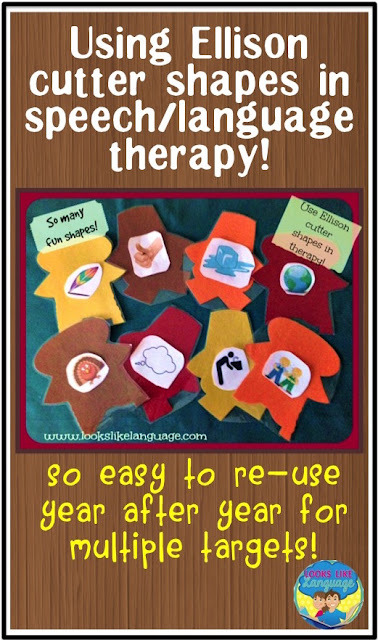 How have you used felt boards in your therapy activities? The Rocky Road to "R"
Do you groan inside when you get a student with an ‘R’ problem on your caseload? Don’t worry, there’s help to be had! It is a difficult sound to correct, but the more ‘tricks’ you have under your belt, the better your chances are that you will find something that works. There are quite a few blog posts by SLP’s about how to achieve placement for the /r/ sound. One that I have found to be extremely helpful is from Katie at Playing with Words 365. I would definitely check it out! Another link to check out: Judy Kuster has compiled an amazing list of techniques that have been used to elicit the /r/ sound. Something in this variety may be helpful to you! Although we all give a big cheer (or a sigh of relief!) when our student has finally achieved a tongue placement for the /r/ that produces an acceptable sound, our job has really just begun. 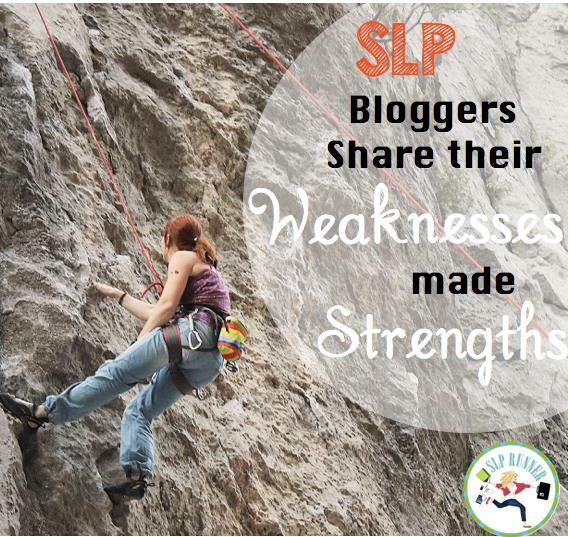 Although that is true for any articulation error, I think that, as SLPs, we feel it more strongly with the /r/. When I suspect that there may be some motor planning or jaw stability issues at play, I am careful to use jaw support techniques when working on placement for the /r/ sound. My favorite way for older students is to have them prop their jaw on their hands, with elbows placed on the table. I've tried using bite blocks as well, but often this just confuses the issue even more as there is something new in their mouth for their tongues to move around. When the jaw is stabilized, however, this lets the student move their tongue more freely to try to find the correct placement. I've had the most success by starting with production of the 'L', 'T' or 'D' sounds and having the student draw their tongue backward along the roof of the mouth until an approximation of 'R' is achieved, but try any of the methods suggested in the links above until you find one that works for your student. I don't worry about lip rounding, the most common substitution, until after a consistent tongue placement has been achieved. If there are mild jaw stability or motor planning issues, it makes sense that we use extra caution in the steps we take to get that “R” sound from isolation to conversational speech. At times, I’ve been afraid to vary the production that helped the student learn to produce the sound for fear of not being able to establish it again! 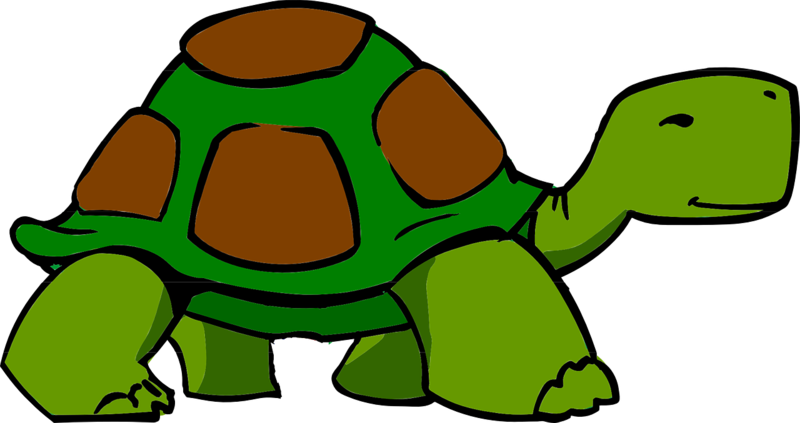 I have learned that slow and steady wins the race. This is how I've done it. 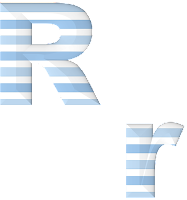 Pair the R + vowel or vowel + R that the student has achieved (the success sound) with the new production you are trying, but do it in alternation. Returning to the initial success sound on every other production helps to maintain successful tongue placement. After the sound production stays stable, you can check to see how many trials of the new sound can be made before the student loses the placement. Immediately, go back to the success sound. Then set the trial # for the new sound where he was successful. Pay attention to the vowel placement chart when you are making your selection of what to try next. Remember those charts? For example, the “R” is generally made high in a closed mouth position, so it makes sense to try it out with “ee” or “ah” as those sounds are not far away from the place of success. The ‘ee’ sound has the benefit of a smiling mouth position, which tends to reduce the likelihood that the ‘w’ sound will be substituted. Each child is different, so try until you get success. Repeat using drills of 10 trials multiple times throughout the session, with breaks in between, until the student can say it correctly and fluently. Then, try to see how many times the student can say the new sound before it breaks down. You are keeping productions successful- always drop back if needed. This error tells you that you can have your student practice up to 3 productions of “ree” before adding in the success sound “er” to maintain stable, correct productions. So, the practice would look like this. Continue building the number of repetitions the student can produce correctly in a row without losing the placement, and soon you will have a stable /r/ sound. Got it? I hope I was able to make this clear! Once you are able to get past the syllable production stage, I’ve used this same co-articulation strategy at the word to sentence level in my “R” Rainy Day Game. I loved finding words that moved from the “er” sound to the initial “R” sound that could be used in sequence together to make phrases and sentences. 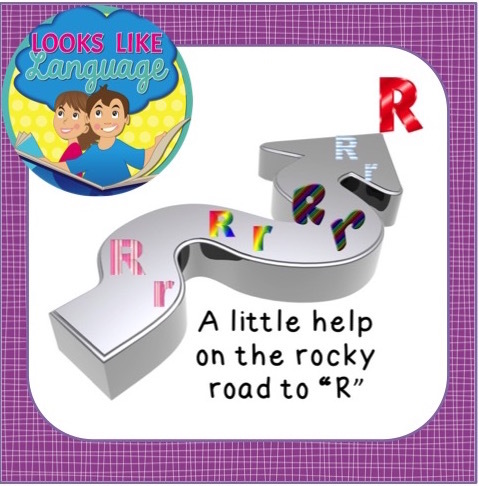 I even included “R” vocabulary words at the upper elementary level to help work on language skills at the same time. I just love being able to address multiple goals with one set of materials! Do you like that, too? Don't forget to check my Rainy Day 'R' post with a craftivity and a FREEBIE! Weaknesses- We All Have Them! 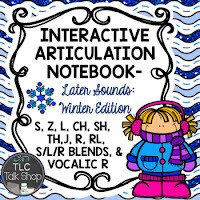 Jen at SLPRunner came up with this wonderful idea for a blog linky and I’m delighted to join in! Each and every one of us has both strengths and weaknesses, including our students, and rarely do we like to face our weaknesses head on! So, thank you, Jen, for giving us this opportunity to place ourselves in the position that our students must face daily. 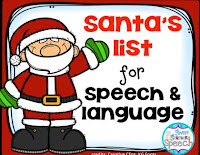 When I started my studies to become an SLP, I remember being surprised at how many people in our field were dealing with speech issues themselves. “How could you help someone improve their skills when you were not able to provide a correct model yourself?” went my thoughts. Now that I am a seasoned SLP, I can clearly see where the opposite can be so true. My particular difficulty is with word retrieval, a problem shared by many of our students. 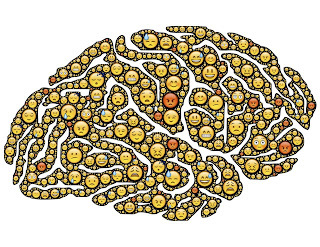 Over the years, I have seen the relief in many students’ faces when I have been able to sincerely tell them that I know just what that feels like, and that I have some ideas for them to try that worked for me. 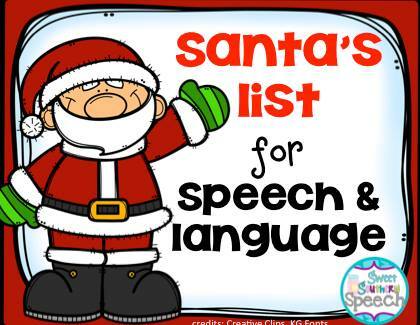 After all, if your speech-language therapist has that problem and can cope with it, maybe you can, as well! My students know that I am telling the truth, because I have to tell them straight away that sometimes I may call them by their partner’s name, but not to worry, I actually do know their name and who I am addressing! We laugh or smile when this happens, acknowledging a shared difficulty, and the session goes on. 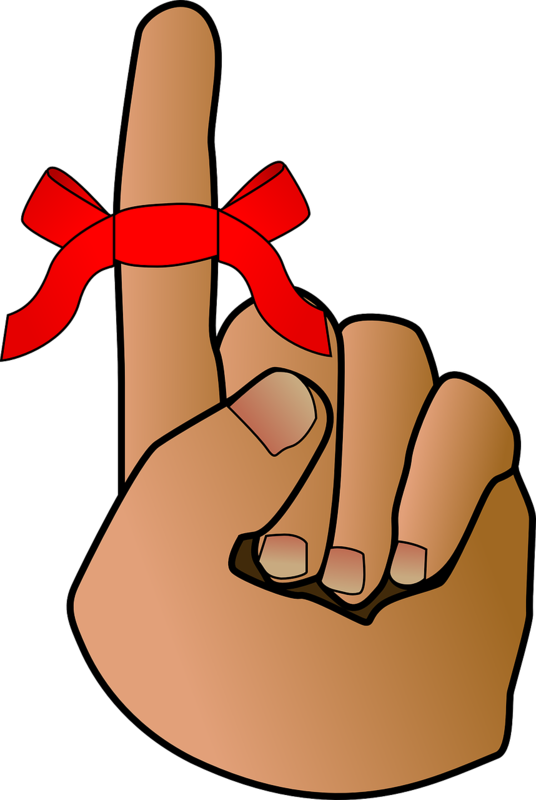 Now, I share the typical word retrieval difficulties, too, so I know many strategies for it, but somehow having problems retrieving a word or a fact never hits home the same way that having the wrong name pop out of your mouth does! 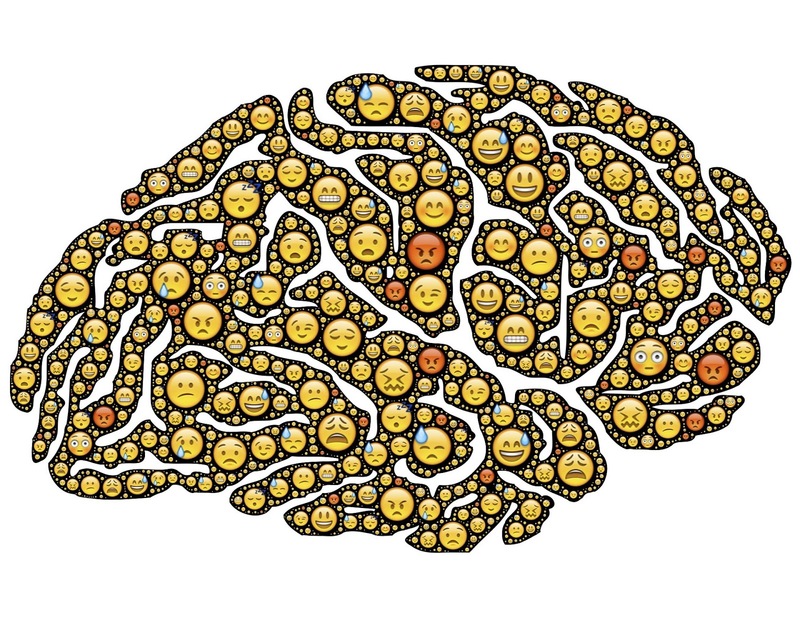 Word retrieval problems don’t actually go away, or so I believe, but there are strategies that can be learned which help lessen the impact on the flow of communication and on getting your message across. Sometimes, I have found that the best strategy is to just own up to your weakness, say you will give the listener the exact name as soon as it comes to you, and just continue with the conversation. Other times, I joke that it is making my students (and family members) practice active listening to figure out my message, as well as requesting clarification when the word that pops out doesn’t make sense in the context or makes the message unclear. Most often, it is important to provide the listener with enough information that they can fill in the gaps and understand what you are trying to say. Often, they will supply the word for you! Therapy strategies for word retrieval problems consist mainly of activities that build the associations between words, providing many paths to aid retrieval of words and much information to use in place of the word when retrieval fails, so that the communication flow can continue. It is important to be careful not to work on continually practicing new vocabulary until the student demonstrates a variety of connections to the word. 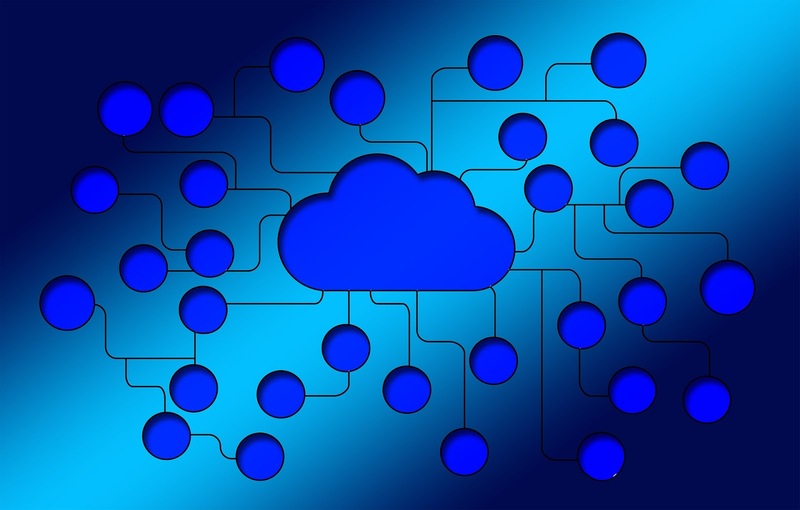 Typically, this would involve being able to define the word, provide synonyms and antonyms, name other items that belong in the same category, and perform rapid naming tasks in a reasonable period of time. 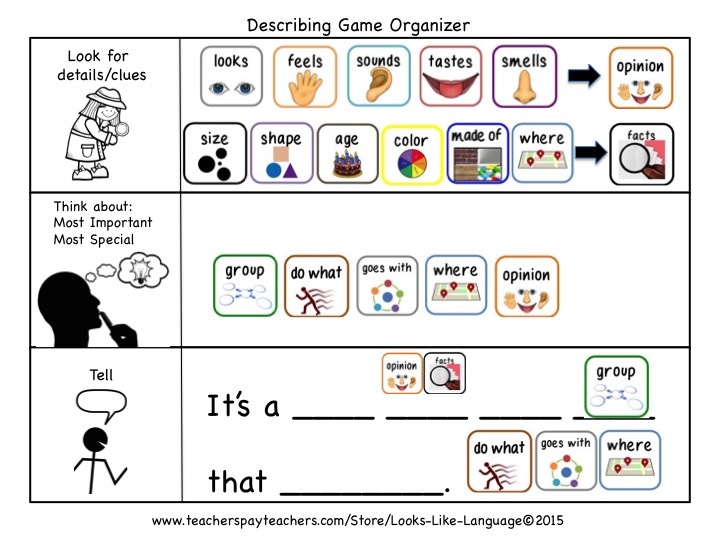 Describing activities are another way to build associations between words, especially if you provide a framework for students to begin thinking about and saying the most important information to provide their listener. For example, substituting “the special dessert you eat on Thanksgiving” keeps the flow going and helps the listener fill in the gaps much more easily than saying “um, that thing, it’s orange, you eat it, you know, on Thanksgiving.” When we teach our students skills without giving them a way to pull it all together in a functional situation, we are leaving some of them without a way to apply what they have learned. I absolutely love using visuals for just that reason! After thinking about why learning the skill is important and how it can be used in varied situations, I love making and using visuals to help my students pull it all together without verbal help from me. It helps them to have a visual image of what to do, so they can process and formulate a response more independently. Take a peek at these organizers in my new freebie to celebrate reaching 1,000 followers at my store. I usually provide materials at differing levels, because who is lucky enough to have groups that are that cohesive? They support the activities in my product Describing and Inferring:Places, which is chock full of activities to build both skills. 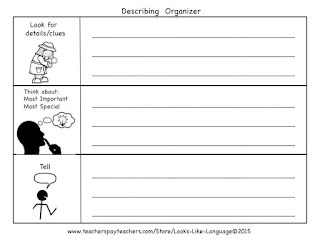 You can use them in any describing or inferring activity to help your students think and organize their responses, however. Don’t be afraid to share your weaknesses with your students, just do so in an appropriate way that supports them and lets them know that everyone has them! Thanks again to Jen at SLPRunner for getting us sharing ours! Check back at her blog to find more SLPs who are sharing. What is your weakness? Did you share with your students? How did they respond? Most of my posts are bringing you ideas for therapy. If that is what you want today, just skip to the freebie information at the end! This post is about a TpT journey, and TpT can be contagious! It is certainly time consuming. It can be a fast journey, or it can be slow. I'll tell you my story, and you can decide for yourself! Two years ago, I never thought that I would ever get to this point and I am so grateful for the people who have followed and supported my shop! I decided to start a store, since over the years I’ve made many therapy materials that were well received when I shared them with colleagues. Little did I know what this journey would entail! It is so much quicker to develop an idea and put it on paper to use with your own students than it is to make a professional product. I started this venture with solid therapy ideas and none whatsoever about using microsoft office. I dove in, knowing that I had to take the plunge whether I was prepared or not, and I am so grateful that no one bought my products for the first 5 months. Yes, I said 5 months! I persevered (and cursed,) learning a lot about desk top publishing as I joked with my family that this was a store for preventing Alzheimer’s, not for actually selling anything! Time went on and I eventually started selling a few products. I am extremely grateful for my early raters who saw the gold nugget of ideas in what I made. By the end of my first year, I realized that I had learned a lot, and a decision needed to be made. I could keep creating new products, or I could go back and revise all of my old ones so that they were packets I could be proud of. If you have gone back and looked through the “My Purchases” section of your TpT account, you know what I decided to do. If you haven’t, it is worth your time! My ideas are the same, but they are packaged so much more nicely! I will continue to update products as my skills grow, so it is worth your time to offer kind suggestions I can include in future updates. (Most sellers will revise products if you ask nicely! The best place to do this is in the ‘Ask a Question’ section of their stores, by the way.) In addition to celebrating my 1,000 followers, I am also celebrating that I have FINALLY finished revising my original products! WHEW!! The FREEBIE that I am offering as a thank you is available through my store. 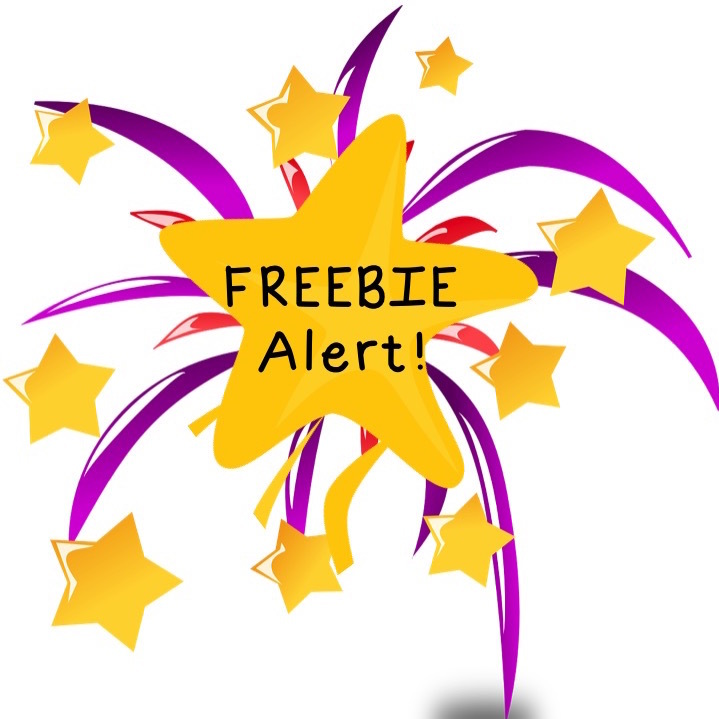 (Although I have additional freebies that are only available through my newsletter. Provide your email on the top right box if you are interested in receiving these.) 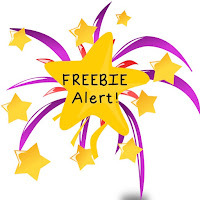 You can read my post about the freebie here. I’m looking forward to celebrating my next 1,000 followers! Thanks so much for helping me along the way. Have you ever tackled a project that involved so much more than you thought it would?